Consolidating IT infrastructures is a continuing trend, particularly in an uncertain economy with organizations looking to reduce operation costs. While many have achieved some level of consolidation, analyst firm Forrester Consulting found that only 13% considered themselves consolidated to the data center, and only 8% fully consolidated within branch offices. Broader consolidation requires overcoming complexity, distance, latency, and organizational silos. The benefits of a well-planned and executed consolidation approach, however, can extend beyond cost savings to include improved risk mitigation and efficiently. 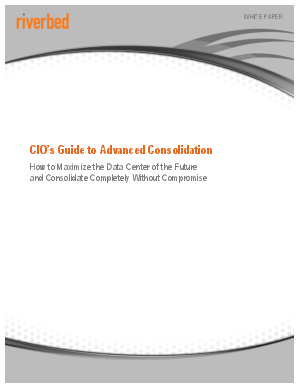 Download now to learn how to maximize the data center of the future and consolidate completely without compromise.